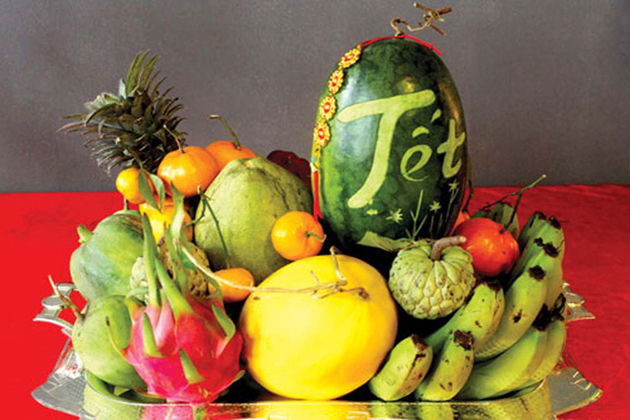 Tet holiday or Vietnamese Lunar New Year is the most significant festival in Vietnam. As a result of being calculated by the lunar calendar, Tet often occurs at the end of January, which is later than the New Year’s Day. 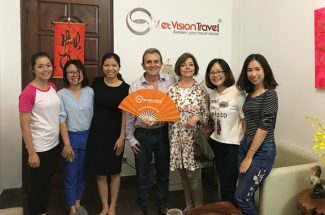 As the longest public holidays in Vietnam, Tet is the most wonderful time for all foreign tourists to spend their vacation in Vietnam enjoying the festive atmosphere and exploring one of the oldest holidays in the world. Tet holiday 2020 is on January 25th, 2020 (New Year Eve is the previous day). Tet Holiday is celebrated to welcome the New Year (Lunar calendar) and summarize what they did in the old year. It is considered an important mark for changes, plans, and progress. In addition, Vietnamese people believe that what they do on the first day of the year will affect its rest. Therefore, they pay great attention to every word they say and everything they do. Furthermore, Tet maybe the only occasion for all family members to have happy moments together after a year of hard-working. 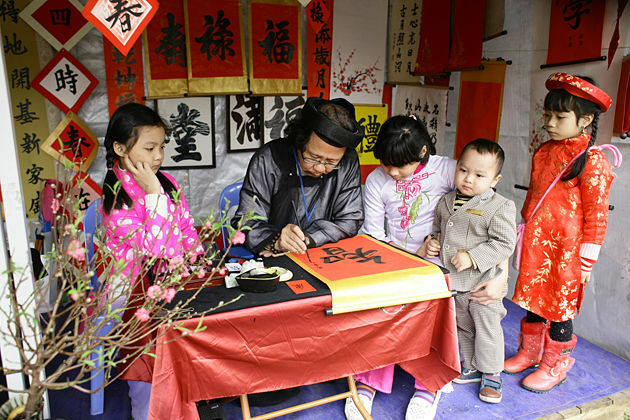 A traditional Tet often lasts for a month. However, the busy life makes it shorter, which is often a week. Recently, some people express their idea to cancel Vietnamese Lunar New Year and only celebrate the Western New Year. Although it is constructive, Tet holiday will have still been remaining as the vital festival in Vietnam because of its priceless tradition, feature, and meaning. It is absolutely mistaken to say that the Vietnamese are celebrating the Chinese Lunar New Year. Although both countries use the lunar calendar, the Vietnamese have different customs and tradition from China. According to the historical document, in the thirteenth century, the Vietnamese people often celebrated Tet holiday by painting on themselves, drinking traditional glutinous-rice wine, using betel nuts to welcome guests, and eating Chung cake, pickled onions. In Ly dynasty (1009-1226), many important rituals were made such as setting up a dome to pray for the rains or building communal houses to crave for a year of abundant harvests. In the period of King Le Thanh Tong (1442-1497), Tet holiday was the most important festival and hundreds of mandarins had to gather at the court to celebrate it with royal families. In the Vietnamese language, to celebrate Tet also means to eat, which affirmed the important role of the cuisine in Vietnamese Lunar New Year. One Vietnamese traditional proverb denotes that you can be hungry all the year except three days of Tet because dozens of delicious foods will be prepared on Tet to feast the ancestors as well as every family members. Chung cake is the traditional cake in Vietnam that only appear on Tet holiday. Tasty and savory Chung cake is made from very familiar ingredients to all Vietnamese such as sticky rice, green beans, and pork, which is wrapped in green leaves and boiled overnight. 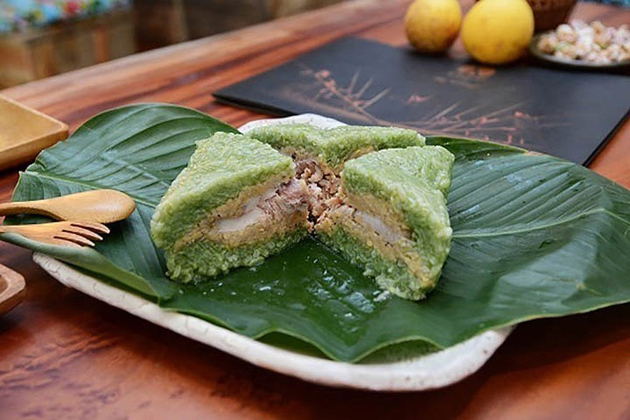 According to a legend that has been passed on for thousands of generations, Chung cake is the symbol of Earth because it combines all unique ingredients of Vietnamese agriculture. Although nowadays Chung cake can be tasted all seasons, enjoying these cakes at Tet holiday still brings special feelings for Vietnamese people. Jam is the common snack to welcome guests on Tet holiday. It is mainly made from dried fruits like carrots, coconuts, apples or some kinds of seeds such as roasted watermelon seeds, sunflower seeds mixed with sugar. The Vietnamese believe eating sweet things on Tet holiday will bring them luck for the New Year. On Tet holiday, people often eat fat and oiled foods which easily cloys their appetite. This is high time for something with low calories and fresh like pickled onions. Pickled onions help the digestive system digest high protein food more easily. In minds of Vietnamese people, Tet is only complete when there are fat meat, pickled onions, and red distiches. Besides, there is a myriad of signature dishes that inspire the taste in different regions on Vietnamese Lunar New Year such as spring rolls, boiled chickens, Vietnamese sausages, sticky rice and so on. Each Lunar New Year will have a symbolic animal. 12 Vietnamese zodiac signs are different from Chinese ones (The fourth zodiac sign in Vietnam is Cat while it is Rabbit in China). Every animal will bring the unique lucky in its year so you can see them everywhere in Vietnam through decorations or advertisement signs. Tet holiday 2020 is the year of the Rat. Peach blossom in Northern Vietnam and apricot blossom trees in Southern Vietnam are also symbols that exclusively appear on Tet holiday. The light red of peach blossom will bring the luck while the yellow of apricot blossom will bring the fortune to the owners. It is said that Tet is not Tet if missing two of them. This is a tray of five different fruits such as bananas, grapefruits, oranges, and other tropical fruits which are only prepared on the Vietnamese Lunar New Year. Although each region chooses different fruits, a tray of five fruits is still used to express the wishes of the host family by their names, colors, and arrangement. It is originally a 5 meters tall bamboo shoot. The chop of the tree hangs different things based on each region such as votive papers, amulet exorcism or alcohol bottle made of straw. It is believed that the tree is the signal for the devils to realize that this place is home of living people, not to harass. In addition, kumquat trees, Dong Ho paintings, red distiches are also believed by the Vietnamese to bring luck and wealth for them all around the year. How is Tet Holiday Celebrated? 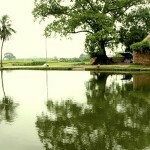 Before Tet Holiday – How Tet Holiday is Prepared? 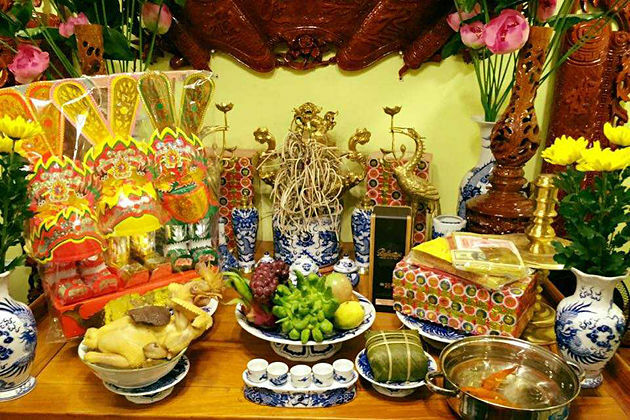 On the 23rd of the last month in the lunar calendar, Vietnamese people prepare the traditional offerings and especially the carps to regale three gods and goddess of their kitchen. Then they will release the carps into the river and these fishes will be used by the Gods as the transportations to come to heaven, according to the legend. At the heaven, they will report everything happening in the previous year of their family to the King of heaven. They will come back on the last day of the year to celebrate Tet holiday with the family. The carps then become the dragons. Tet Ong Cong, Ong Tao of Tet holiday 2020 is on January 17th. Tet holiday is also called by a jolly name “house-cleaning festival”. A week before Tet, all members of the family clean the house, the garden, and the altars as well as redecorate them together. Broken things will be repaired, old things will be replaced. Clothes and decorations such as lanterns, distiches, led lights will be bought. All that preparations have the same purpose – to be the best to welcome the New Year and to receive luck as well as fortune. 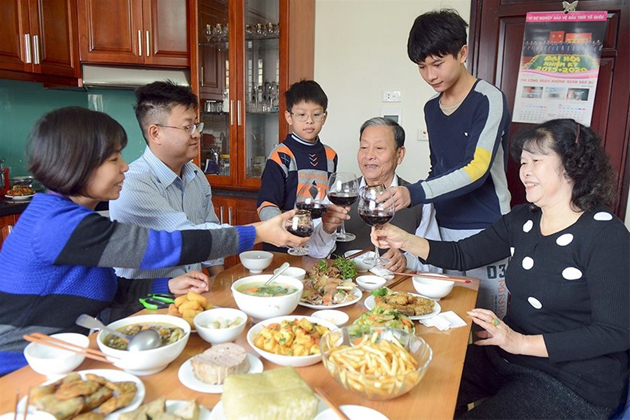 On the last day of the year, every member of different generations gathers around a grand banquet to enjoy the last meal of the year. The talk at that time is about things already happening in the year. The ambiance of the reunion is always the most wonderful and happiest of all time. In New Year Eve, the young often go out to watch the firework performance while the elderly and adults stay at home making offerings of pig head, boiled chicken, rice and salt for outdoor worshipping to the Gods and indoor one to the ancestors. 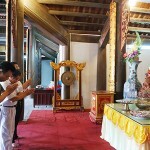 They will pray for a new year of luck, health, and fortune to every family member. After that, the young come back home and become the first one coming to the house in the new year. It is believed that the wishes of that person for the host will come true. Then everyone gathers again to drink some alcohol or juice. Then the wishes, as well as plans of every person for the new year, will be shared with others. 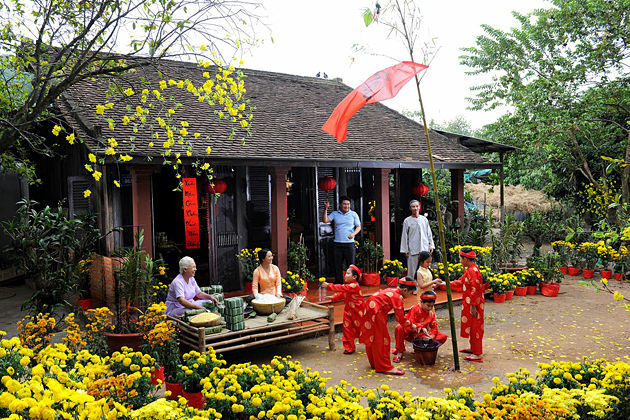 Tet Holiday traditionally lasts for three days. People often stay at home to welcome guests to their house or go to relative and neighborhood houses. The elderly will be received the wishes for health, the adults will be received the ones for fortune and success while the young and children will be received lucky money. Laughs and talks appear everywhere on Tet holiday these days. Besides, Vietnamese people often go to pagodas. By donating money and asking for letters, they will receive several lucks and fortune. Tet ends when votive papers are burned and offerings are taken down from the altars to share for every family member. It is the time for people to join in festivals all around the country such as buffalo fighting festival or boat racing, wrestling, lion or dragon dances. Festivals will be organized for a month after Tet holiday so you are able to attend and explore them as many as possible. Vietnamese Lunar New Year is the priceless value of Vietnam and an indispensable part of the life of all Vietnamese people. 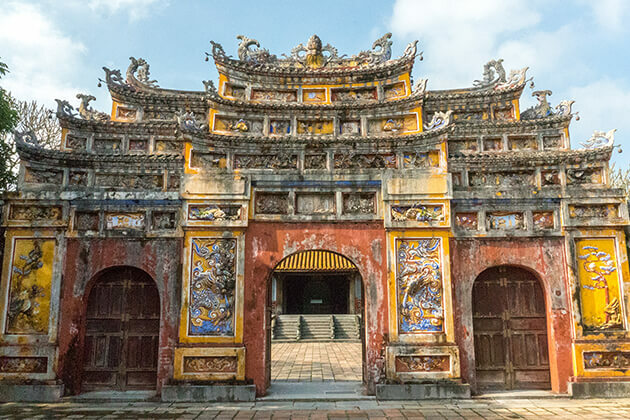 Plan Vietnam tours to enjoy Tet holiday and experience unforgettable experiences of Vietnamese cultures, customs, and tradition. Vietnam has such a wonderful Tet holiday. See you one day. Love from England! To Vietnamese people, Lunar New Year or Tet holiday is the most important festival around the year. The festival often takes place from late January to early February depending on the cycle of the Lunar Calendar. The three days of January of Lunar Calendar are the most significant days but people in Vietnam often spend nearly half of a month to celebrate the festival. Traditionally, the purpose of Tet holiday is that Vietnamese people would like to thank Gods for bringing the Spring with full of blossoming flowers and trees and say goodbye to the cold winter. 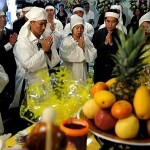 Tet holiday is a spiritual opportunity for living people to invite deceased ancestors to join family gatherings. This is also an occasion for members in the family to reunite after a long year working far from home. Whatever they do and wherever people are, they quickly find ways to return their hometowns and meet their loved ones. 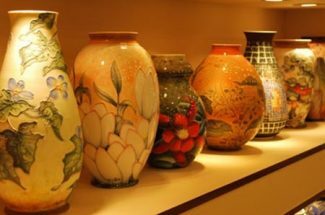 Before Tet holiday, people clean their houses and decorate them beautifully with kumquat tree, peach blossoms or apricot blossoms. The streets are also festooned with lightening lanterns and red banner “Chuc Mung Nam Moi” or “Happy New Year”. They try to clean and dush-wash everything because the cleaning is believed to erase and sweep away all the dust and bad things that accumulate in the old year. Additionally, everyone has their hair cut, buy new clothes and bring gifts to their relatives, friends and supervisors. They spend lots of money to buy all the best things to ensure that they will have a prosperous year. Another viral thing is that all the debts should be paid off or else they will bring bad lucks to the whole new year. Tat Nien – or the meal in New Year’s Eve is the meal to finish the entire year. There are lots of well-prepared dishes and everyone happily enjoys the meal while talking about good memories and nice things. They have many traditional foods such as Chung Cake (Sticky rice cake), Day cake, pickled onion, pork, beef, sweets, dried fruits, and seeds. After that, people may go out to watch fireworks displayed at the public area or simply stay at home and watch Tao Quan (a very famous TV show in Vietnam that is only broadcasted at the 30th of Lunar December). On the New Year’s Day, the first guest coming to the house plays an important role because they are believed to hold in their hand all the lucks of the family. Then people visit their grandparents and relatives. The second day is for friends and colleagues and the third day is especially for teachers. In those days, children are given lucky money inside the red envelopes as the red and lucky money are considered good things and may keep children away from the evils. People also go to the pagodas and pray so that they could have a year of prosperity, happiness, and health. Tet holiday nowadays is still being well preserved. This holiday is not only for relaxation and family gatherings but also a chance for Vietnamese people developing their cultural and national identity. 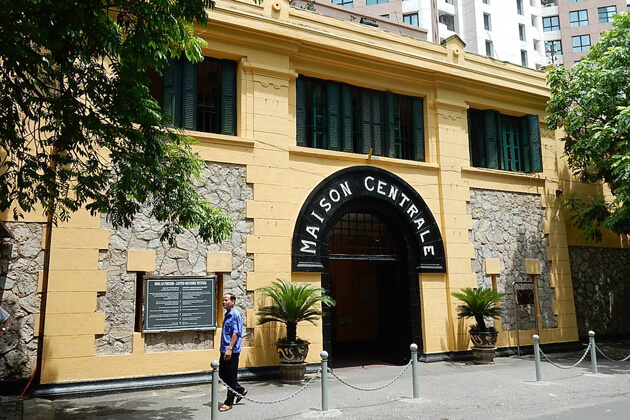 I consider going to Hanoi in early February and I just read that Tet holiday 2019 falls on February 5. Does the holiday affect tours, restaurants, tourist attractions, etc? 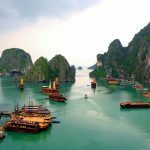 Would it be advisable to get to Vietnam before or after Tet holiday? It is true to say that travel during the actual days of Tet holiday is quite difficult. The accommodation might be plentiful and some restaurants will be closed according to the holiday break. 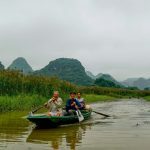 However, I think you should come here in Tet holiday to really appreciate the excitement amongst the locals and the unique atmosphere in Vietnam. I’m sure that you don’t want to miss it, just remember to book your tour or accommodation as soon as possible to ensure your stay. I’m going to Vietnam in late January for about 2 weeks. How many days are in Tet ? I really want to enjoy Tet holiday atmosphere once in my Vietnam vacation. Vietnamese Tet (Lunar New Year) is considered as the biggest and longest holiday in Vietnam, which may last up to seven to ten days. Vietnamese New Year in 2019 will last from 4 February ( New Year’s Eve) to 10 February. Hope you will have a great time in Vietnam and enjoy the Tet atmosphere to the most. We will be in Ho chi Ming City Feb.7th and have a ride set up from airport directly to an apartment we rented on back beach in Vung Tau through Feb. 11th. Do you have any ideas on what we should try and see during Tet? Also will and when will the banks be open in Vung Tau darning these times? Thank You. 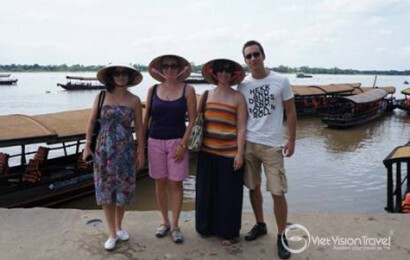 I recommend you should experience a colorful and exciting Tet holiday in Ho Chi Minh City or a traditional but interesting Vietnamese Lunar New Year at Mekong Delta. Vung Tau beach is also a wonderful destination for you to enjoy this festival. Banks and other state-run offices will come back to work at February 11th, 2019. I will definitely go there someday and meet the woman that I love… So I think this is the best time to have vacation there!